Arguably one of Meryl's all-time best performances (and we all know that's saying something) she's a pleasure to watch free of accents and gimmicks (though I do occasionally love me the gimmicks and always love me the accents, it's nice to see she can carry a film without the extras). 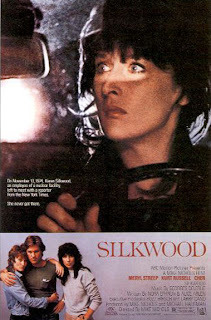 Playing Karen Silkwood, the mulleted blue-collar type who sees mishandling within her company, in which workers are exposed to toxic levels of radiation. The film sounds like the type of biopic that would get Oscar voters into rah-rah mode in the aughts, but it's far from a traditional inspirogram. Karen is mouthy and on occasion crass, and we're not meant to find her saintly. She macks on her co-worker boyfriend (Kurt Russell) without hesitation and lives with her no-nonsense lesbian roommate (Cher), engaging in alcohol-guzzling and debauchery as desired. So as Miss Mae West may or may not have put it, she's no angel. But her struggle with the man is so compelling and so disturbing (and the cinematography is more incredible than it needs to be) you feel like Silkwood is your buddy, your pal, and your advocate.